In Virginia and West Virginia, residents and activists are battling natural gas companies over a natural gas pipeline currently being constructed. The Mountain Valley Pipeline will extend 303 miles from northwestern West Virginia to southern Virginia, with a recently proposed 70 mile extension into North Carolina. The project is being funded and operated by Mountain Valley Pipeline LLC, owned by EQT Midstream Partners, LP; NextEra US Gas Assets, LLC; Con Edison Transmission, Inc.; WGL Midstream; and RGC Midstream, LLC. The pipeline will transport up to 2 billion cubic feet of fracked natural gas daily from the Marcellus and Utica shale basins, "to supply the growing need for natural gas in the mid-Atlantic and southeastern regions of the United States," according to a EQT Midstream Partners spokesperson. The Federal Energy Reserve Commission approved the pipeline in October 2017 with a 2-1 vote, with two seats on the commission vacant. The only dissenting vote was cast by Cheryl LaFleur, who cited environmental concerns and skepticism over the pipeline's necessity as influential factors on her vote against its approval. In February, a federal court denied a request to delay the pipeline's construction filed by Appalachian Voices and five other conservation organizations. Mountain Valley Pipeline LLC is currently clearing forest along the Appalachian Trail and in Jefferson National Forest for the pipeline construction. According to FERC, Mountain Valley Pipeline has until May 31 to complete tree cutting. Pipeline opponents claim the pipeline's construction will negatively impact the scenery and pose various environmental risks in the Appalachian region. "We are concerned about the Appalachian Trail and the devastation that's going to occur to the views from Peters Mountain and all along this region," said Maury Johnson, a resident and property owner in West Virginia opposing the pipeline, in an interview. "Back when I was a teenager I used to help maintain the trail, and I heard stories from those folks who helped build it in the 1930s and 40s. The trail took a 22 mile detour just to get on top of Peters Mountain and get the iconic view across West Virginia. Now with this project, you'll see the pipeline coming at you probably for thirty miles." Johnson noted that pipeline surveyors visited the property on his family farm, and he has dealt with them since surveying began in early 2015. He claimed the surveyors rushed the job, often missing details that he had to frequently point out for them to record. "Some of the work that has been done has been very flawed," he said. On his Facebook account, Johnson has posted several photos of sediment barriers set up by Mountain Valley Pipeline being breached to prevent erosion, just one of the several risks to water quality in the area posed by the pipeline. Johnson also expressed concern for Bentley's coral root, a plant listed as vulnerable by the International Union for Conservation of Nature, only found in a few areas of Virginia and West Virginia, as one of the species at risk from the pipeline's construction. The Mountain Valley Pipeline has sued several hundred landowners in West Virginia and Virginia to invoke eminent domain to allow it to cut trees and run the pipeline through their properties. Some landowners and pipeline opponents have resorted to conducting tree sit-ins, building treehouses in trees on their own property to prevent the Mountain Valley Pipeline from clearing their land. "They came through a few days ago and cut all around me," said Red Terry, a 61 year woman who has lived in a tree on her property off Poor Mountain Road in Roanoke County, West Virginia for at least three weeks, in an interview. "My daughter is also in a tree and had them on all four sides of her. She cried all day. Nobody should have the right to eminent domain for something that is not going to help people. It's to help themselves, profit before the people." Neighbors, friends, family and activists have helped assist Red in her tree sit-in. Despite her continued protest, she said that Mountain Valley Pipeline cut down several trees on her property and have pressured her to come down, including allegedly blackmailing her sister with artifacts found on her property in exchange for Red leaving the tree. "When they were cutting my trees and I had tears running down my face, the cops were watching the devastation also, I looked at one of them and I thought he was going to start crying. At the same time, four Mountain Valley Pipeline security guards were laughing, carrying on, and thought it was the greatest thing in the world." 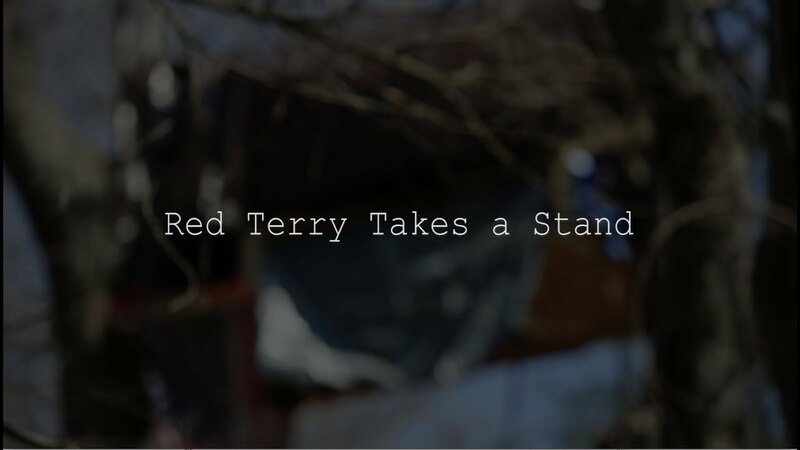 Last Thursday, police formally pressed charges against Red Terry and her daughter; trespassing, obstruction of justice and interfering with property rights. The charges have now created a stand-off, as Red and her daughter will be arrested as soon as they descend from their trees. But their fight has become a rallying call among other pipeline opponents in the area. On Peters Mountain, along the West Virginia and Virginia border, activists and local residents have organized other tree sit-ins, including setting up a monopod tower to try to block an access road to the pipeline construction. "The frontline communities impacted by the pipeline have been very supportive. The people in Appalachia have consistently throughout history fought back against exploitative industries like the Mountain Valley Pipeline," said Ashley, a tree sitter on Peters Mountain, in an interview. "There have been consistent police and security forces harassing us. Some are more hostile to us than others, but even when they try to play the good cop role, there's no doubt in my mind they are working on behalf of the interests of those building the pipeline." The identity of this tree sitter is being kept anonymous to prevent legal action against them. The U.S. Department of Agricultural Forest Service shut down the road and the area around the monopod from the public, only permitting Mountain Valley Pipeline services access. The monopod organizers have accused the U.S. Forest Service of preventing supplies, water and food from being brought to the protesters. The U.S. Forest Service did not respond to a request for comment. On March 20, Monroe County Circuit Court Judge Robert Irons denied an injunction filed by the Mountain Valley Pipeline against protesters to have them removed, permitting the tree sit-ins to continue. Pipeline opponents have pointed out the powerful political influence the Mountain Valley Pipeline companies have on elected officials in West Virginia and Virginia. The companies invested in Mountain Valley Pipeline have significantly backed both Republicans and Democrats. In the 2017-2018 election cycle, EQT Midstream Partners gave Virginia Governor Ralph Northam's campaign $25,000 and his inaugural committee another $25,000 after donating $20,000 to Republican Governor candidate Ed Gillespie's campaign. In total, they've donated $60,000 to Republican state legislators in Virginia and $56,000 to Democrats. At the federal level, EQT has donated $5,000 to Senator Joe Manchin (D-WV) and $1000 to Senator Shelley Moore Capito (R-WV) this election cycle. Opposition to the pipeline has started to draw some support from elected officials. On April 16, 11 Virginia House delegates, including Lee Carter, a Democratic Socialist who unseated one of the state's top Republicans in a November 2017 election, signed onto a letter of support for peaceful protesters against the Mountain Valley Pipeline. "We oppose both the Mountain Valley and Atlantic Coast Pipelines," said Tom McIntire,a spokesperson for Delegate Lee Carter, in an email. "These projects do not provide any benefit for Virginia or her residents and ask those same residents to bear costs that are too great to reasonably expect of them. With every avenue we are given, we will work (with our colleagues of both parties alongside advocates) to ensure that these disastrous projects are halted." As elected officials begin to support efforts to stop the Mountain Valley Pipeline, conservation organizations are still pursuing litigation to halt construction. There are currently four separate cases in litigation being represented by attorneys for Appalachian Mountain Advocates and other conservation organizations. One challenging the state of Virginia's clean water act 401 certification of the pipeline and one challenging the the actions of the U.S. Forest Service to grant a right of way through Jefferson National Forest are scheduled to be heard on May 8. The third case challenging the Army Corps of Engineers' Water Quality Review is scheduled to be heard in September, with the fourth case challenging the "certificate of public convenience and necessity" granted to the pipeline by the Federal Energy Regulatory Commission still pending a briefing schedule in Washington, DC court.